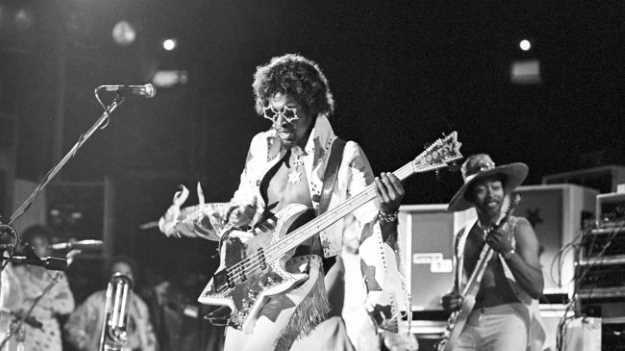 If you play any form of funk bass, you owe Bootsy Collins - the legend who’s played with James Brown and Parliament-Funkadelic, like you didn’t know that already - a serious debt. Joel McIver meets the great man for tears of laughter, tears of sadness and enough groove to sink a battleship. 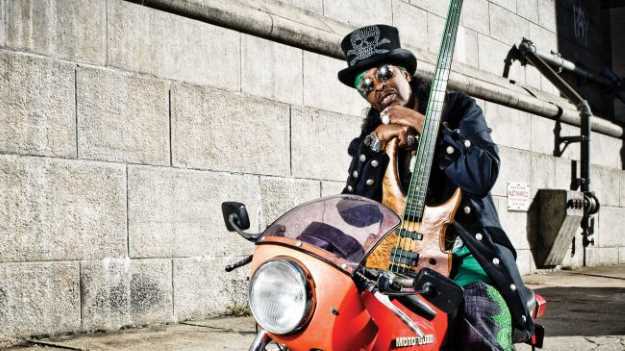 We feature some bonafide bass legends, for sure, but very few come with a pedigree quite like William Collins, or Bootsy as he’s known to the entire bass-playing world (and significant chunks of it beyond). If you’re familiar with the man and his playing, you’ll know what a force of nature he is, epitomising the stagecraft of the era in which he grew up, and laying down the parameters of the slap and the pop for a generation of bassists. 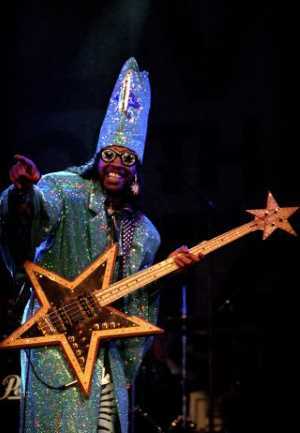 Check for footage of Bootsy in full flow at any stage of his career, but especially in the 1970s and 80s, when his work with the psychedelic funk bands Parliament, Funkadelic and their many spinoffs lit up the rock landscape, and you’ll be confronted by an explosive figure. Bootsy was, like his hero Jimi Hendrix and his contemporaries Sly Stone, Larry Graham and Verdine White, a musician who introduced an air of extrovert madness to his performances and recordings. There was, and is, literally no-one like him. 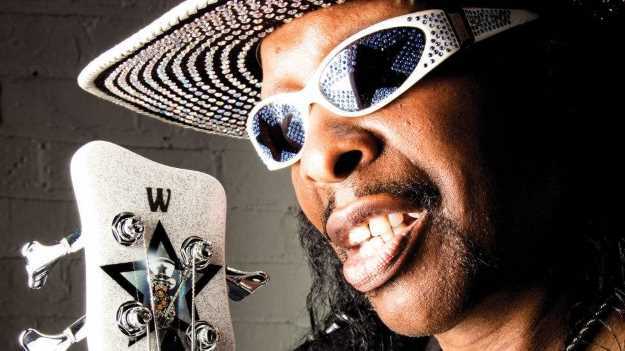 When we catch up with Bootsy for a chat about his new album, World Wide Funk, we’re braced for an encounter that is as unhinged as his on-stage character would suggest. But no - the now 65-year-old legend is cool as a cucumber, mellow to the core and simply happy that we like his new tunes. Mind you, after the career Bootsy's had, he’d need to be a pretty cool thinker just to get through the day: he started out in 1970 with James Brown, a bandleader for whom the phrase ‘mad as a box of frogs’ might well have been coined (see below for evidence). His next big band was the aforementioned P-Funk collective, whose influence has permeated the very DNA of hip-hop and modern soul, while his own Bootsy’s Rubber Band took the brand even further. Solo albums and collaborations with artists as diverse as Deee-Lite, Talking Heads, Bill Laswell, Herbie Hancock, Buddy Miles and his current guitar partner Buckethead have ensured Bootsy’s legacy. Not to mention his Funk University, an online school where he teaches alongside tutors Les Claypool, Meshell Ndegeocello and Victor Wooten. Can we cover all this in a single interview? Hardly - but if you ever get a chance to sit down with Bootsy and talk music, make sure you take it: the man is hilarious, unstoppable and also emotionally honest. Your new album is great, Bootsy. How did you hook up with your co-producer Alissia Benveniste? You’ve also worked with Chris ‘Freekbass’ Sherman in the past. Are you aware that you’ve influenced a huge number of bass players? Nowadays funk bass is faster and more technical than ever, it seems, at least judging by the bassists we interview. When did that happen, from your perspective on it? It’s all just growing and growing. Nobody knows how far it can go, other than Victor Wooten! You were contemporaries with Jaco Pastorius. Did you know him? You’re known for star-shaped basses. Is the five-pickup Warwick Space Bass still your main instrument? “I go into different amps. On the new album I used my original Alembic preamps and Jonas Hellborg preamps, then Mesa/Boogie, Hughes & Kettner and Crown amps, with JBL speakers. I’m also talking right now to Funktion-One, a company in the UK that makes 32” speakers. They do a lot of electronic music and DJs and all that stuff. I’m thinking about having 32s on my low end instead of the 18s. Do you ever take any of your old gear out on the road? “I don’t take the original 1975 Star Bass out no more, because in 1998 we flew over to Europe and when we got there, the airline couldn’t find my bass. It took two weeks to get it back! Bernie Worrell knew this one chick that worked at the airline, so he called her up and asked her if she could go down and look for it, because she knew what the bass and the case looked like. She went down and looked for it, and she said that it was just sitting over in a corner by itself. Which other basses do you still have? “The Funkadelic bass that I played is in the Hall Of Fame, but I still have a ton of my old basses. You remember the 1958 Ampeg with the holes? I got that one, fretless. Victor Wooten came up and broke that in. Oh man, he killed that sucker! We recorded a whole 60 minutes of Victor just playing that bass non-stop. It was incredible. “And then I got this Vox bass - remember those old hollow-bodied ones? It’s like a Gibson, but with a single cut. It’s got fuzz on it, and sustain, with the little buttons you can push. I played that the other day too. I’m re-finding myself, because those are the basses that I started off with. It was great to see a track dedicated to the late Bernie Worrell on your new album. He always came across as more introverted than you. “I was always a pretty good talker: I would be on the street, rapping with the fellows, you know, so I was always pretty good with that. A lot of people would make fun of Bernie under their breath, because he couldn’t do interviews, and stuff like that which seemed easy to do. Do you look back fondly at the early part of your career? “Coming up at that time was the best, because we had a chance to experience the free love and the peace. Now, getting a chance to share that again is what I love. Those good vibes, man. The two hours on stage, communing with your fans, never goes away though - right? “Yeah. That’s all you have to hold onto, plus the time you have together, even if it ain’t with the whole group. Bernie would come to my house just to get away from everything. All he wanted to do was just walk by himself, and to be allowed his space. I guess every person would want that, but he really needed it, because he was pure genius. He handled it the best that he could, for a good while. I have to ask this question. 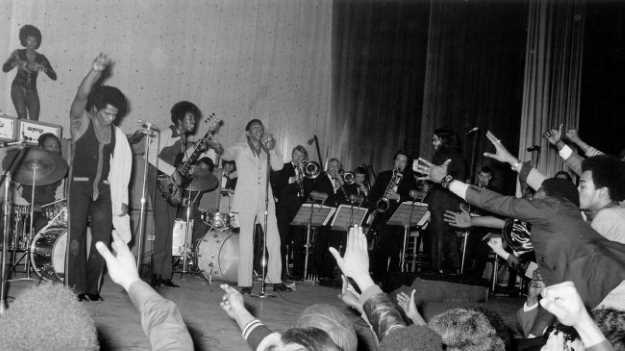 What was James Brown like? “Oh! [bursts out laughing] Oh man... he was that guy, you know. He was definitely that guy! He was a hell of a cat. He worked day in and day out, and you wouldn’t understand why he did the things he did, because he just felt that he was by himself. I never understood that, until I got into having to take care of business of my own. Wasn’t he famously stingy with money? “We didn’t get hit as hard as his first band, because he couldn’t threaten us with taking our money. We were used to getting no money no way, hahaha! Man, I’ve seen some stuff... with James, he would always try to break you down. What was his reaction to being laughed at? “Man, it worked because he stopped calling us in the dressing room. We knew we had it, and we said, ‘Okay, that’s what that was all about’. But before that, man, he was killing us with all that ‘Y’all ain’t on it’. He was sweating profusely, his knees were bleeding - we just wore him out, and he would still call us in and tell us it wasn’t happening. And then, when you went out there and messed up, and the show wasn’t really good, we’d all go back to the dressing room with our heads down because we’d had a crappy night. Thanks for sharing, Bootsy. You’ve had a career like no other. World Wide Funk is out now on Mascot Records.